Shaolin Tong Bei Quan is one of the earlier boxing Shaolin Kung fu, emphasizes the ape back or monkey arm to take potential, so it is also called "pass back the ape", "White Ape Tong back". In the upper limb movements, Zhang Quan and use, there are ups and downs, be the most changeful. "As the tiger jump, falls like the eagle catch". 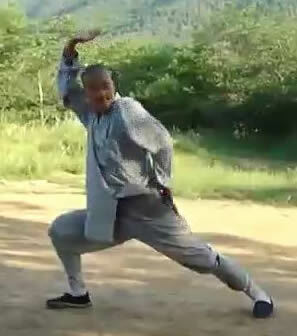 Shaolin Tong Bei Quan technique, pat, wear, fall splitting, drilling, there are steps, walk, walk steps, leg hook, kick, hoof, elastic etc.. Routine movement left arm wrist, arms requirements fall, shoulder and arm hanging, split up beat fast, flexible, and flash show clear, crisp, cold spring back force, tough interleaving. Tong Bei Quan with its special stretch known. Stretch to force from the back, the shoulder, elbow, in order to achieve the fingertips, so the back, shoulder, elbow and coordination, forced stretching, not simply arm. In fact, this requirement in other Boxing (such as pigua boxing, Bajiquan, boxing) also stressed, but in Tong Bei Quan said to become more prominent. Another feature of Tong Bei Quan is to attack at a higher position quickly and skillfully, in practice the attack and defense technology to practice a lot of soft soft. Compared with the general coordinate boxing boxing, boxing or the palm of the hand shape is rich, the Tong Bei Quan which are single and palm, Liao Yin palm, palm, palm, double cover the foot palm, clap, a boxing, boxing, boxing, flat tip beheaded; pigua boxing mainly through preparing a hook hands, broken palm, palm, palm, Liao Yin Yi Zhang, in boxing, jumping in boxing, boxing, Li Chong Chong Quan, buckle in the stone monkey boxing, monkey boxing etc. by formula.